It's impossible to talk about hoverboards without invoking a particular movie title, so we're not even going to try: Remember that awesome scene from Back to the Future Part II? 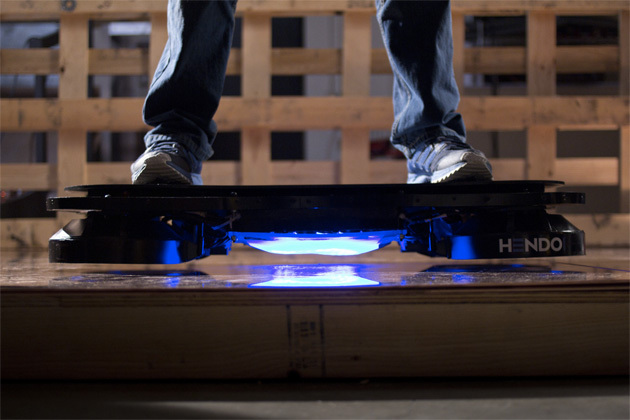 It's one step closer to reality: A California startup just built a real, working hoverboard. Arx Pax is attempting to crowdfund the Hendo Hoverboard as a proof of concept for its hover engine technology -- it's not quite the floating skateboard Marty McFly rode through Hill Valley (and the Wild West), but it's an obvious precursor to the imagined ridable: a self-powered, levitating platform with enough power to lift a fully grown adult. I initially approached the floating pallet with caution, expecting it to dip and bob under my weight like a piece of driftwood. It didn't. The levitating board wiggled slightly under my 200-pound frame, but maintained its altitude (a mere inch or so) without visible strain. Arx Pax tells me that the current prototype can easily support 300 pounds and future versions will be able to hold up to 500 pounds without issue. Either way, you'll need to hover over a very specific kind of surface to get it to hold anything: The Hendo uses the same kind of electromagnetic field technology that floats MagLev trains -- meaning it will only levitate over non-ferrous metals like copper or aluminum. Riding the contraption was a lot fun, but also quite the challenge: The Hendo hoverboard doesn't ride at all like McFly's flying skateboard. In fact, without a propulsion system, it tends to drift aimlessly. Arx Pax founder and Hendo inventor Greg Henderson says it's something the company is working on. "We can impart a bias," he tells me, pointing out pressure-sensitive pads on the hoverboard's deck that manipulate the engines. "We can turn on or off different axes of movement." Sure enough, leaning on one side of the board convinces it to rotate and drift in the desired direction. Without feeling the friction of the ground, however, I had trouble knowing how much pressure to exert -- Henderson's staff had to jump in and save me from spinning out of control. Clearly, this might take some practice. As fun as its current form is, Henderson didn't necessarily set out to reinvent transportation. The Hendo engine's original inspiration came from architecture. "It came from the idea of hovering a building out of harm's way," he says. "If you can levitate a train that weighs 50,000 kilograms, why not a house?" After some prodding, he clarifies the idea as a sort of emergency lifting system that could theoretically raise a building off of its foundation during an earthquake, essentially rendering the natural disaster's tremors harmless. The idea sounds as fictional as, well, a hoverboard -- but he already built one of those. Henderson says that floating a building is a long-term goal. Right now, the technology is in its early stages, and he's just trying to get it in the hands of engineers with big ideas. That's where the Hendo "white box" comes in. Backers who contribute to the company's Kickstarter at the $299 level will receive a complete, working Hendo hover engine and enough hover surface to play around with. It's a developer kit, Henderson says, and he wants makers to use it to build their own hover projects. If they have an idea they want to take to market, Arx Pax will work with them to make it a reality. "The most important piece of it all for me is the idea of taking away the limitations of how we think about problems in general. Not just thinking outside the box, but off the page," he says, explaining how Hover technology could be used to solve old problems in new ways. "When you do that -- when you approach problems that were seemingly impossible in different ways -- you'll never cease to be amazed by the solutions you can come up with." While long-term goals go far beyond that of the not-so-humble hoverboard, there are plenty of Kickstarter goals focused on scratching that itch exclusively. For instance, 250 backers at the $100 level will be eligible for a five-minute ride on one of the company's prototype boards, and $1,000 buys a privately coached hour-long ride. Not content with merely renting hover-time? Okay, okay: The first 10 backers to contribute $10,000 will get a hoverboard to keep. The delivery date? 10/21/2015 -- the date Marty McFly arrives in the future.